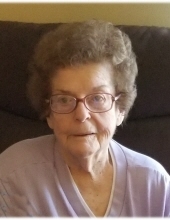 Betty Katherine Woods, age 88, of Allegro Lane, Loveland, Ohio departed this life on Monday, November 19, 2018 at the Hospice of Cincinnati. She was born on November 12, 1930 in Clinton, Indiana to the late Francis Shelley and the late Mabel (Barnett) Shelley. Besides her parents, she was preceded in death by her husband, Archie Woods and son-in-law, Roy Beck. She is survived by her four daughters, Judy Ellen Buroker (Paul) of Sweetser, IN, Debera Kay Harmon (Eugene) of Knoxville, TN, Connie Jean Miller (Gordon) of Cincinnati, OH, and Susan Joyce Beck of Cincinnati, OH; nine grandchildren, Steve Buroker, Jenny Lemons, Samuel Harmon, Stephen Harmon, Rebecca Costello, Rana Amann, Dennis Beck, Dale Beck, and Dan Beck; ten great grandchildren; two nieces, Julie Ann Shelley of Titon, IN and Sheryl Akers of Logansport, IN; nephew, Jimmy Shelley of Kokomo, IN; and a host of other family and friends to mourn her passing. Visitation will be from 1:00 PM until the funeral hour on Friday, November 23, 2018 at Croley Funeral Home. The Funeral Service will be at 2:00 P.M. Friday, November 23, 2018 at the Croley Funeral Home Chapel with Rev. Eugene Harmon officiating. Following the Service she will be laid to rest in the Croley Addition of Highland Park Cemetery. To send flowers or a remembrance gift to the family of Betty Katherine Woods, please visit our Tribute Store. "Email Address" would like to share the life celebration of Betty Katherine Woods. Click on the "link" to go to share a favorite memory or leave a condolence message for the family.